Artist Exposed is a visual series that photographer henrY Leiter is creating about working artists. It is about spending time in their spaces / studios and observing their process. If you know of an artist who would like to share their process please feel free to contact us. Courtney DeCosky and Jeffrey Williams performing on their deck in Gambier, Ohio by photographer henrY Leiter. 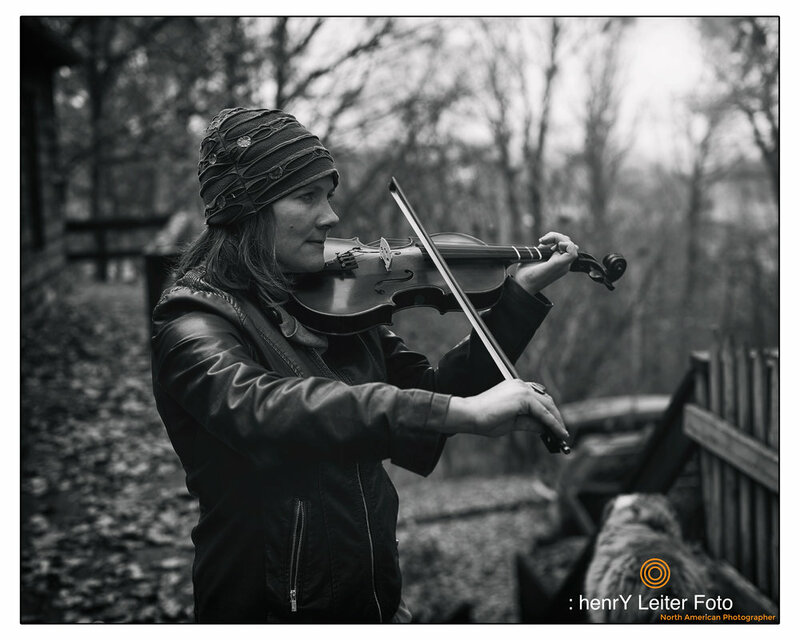 Courtney DeCosky playing the fiddle on her deck in Gambier, Ohio by photographer henrY Leiter. When Courtney knocked her guitar out of tune on her way to the stage in her ninth grade talent show and sang Bobby McGee a Capella, after a very failed tuning attempt, she knew she was destined to find a group of musicians that were much better than her, allowing her the mindless freedom to wail. Though her toughest critics (children - Harry and Finn) say that sometimes mama sing too loud, there is nothing that Courtney enjoys more than singing her heart and soul out and releasing all the pain and suffering that life kindly has to offer again and again. “can you play a little louder while I'm tuning? Jeffrey began his musical career at age nine as a child Elvis impersonator; setting the ladies auxiliary circuit ablaze, literally, with a tender and convincing pantomime and raucous hip-shake. After the Pinehurst Rotary Club fire of ’83, rumored to be set backstage by Williams and a Sinatra-impersonating 6th grader in a bizarre hair gel and stereo wire experiment, Jeffrey moved to the isolation of the Canadian wilderness to begin writing folk songs of transformation and awakening; and grow his first beard. There he met his early songwriting counterpart, Shamus Blamus, and formed the polka-punk fusion band, Death to Shoe-buckles. Subsequently banned from Canadian airplay for obscene references to the national mascot, the pointed-tail beaver, he was deported back to his home state of Virginia, where his musical biography rekindles with reality. Influenced heavily by early country and folk roots, and blended with progressive college radio styles, Jeffrey began writing songs and playing with bands in the late 1980’s. His first band’s EP release shattered regional sales records by selling over 12 copies in the first week within a nine block radius of the band’s garage. Riding the success of overdeveloped imagination and unwarranted stardom the band left the east coast and moved to Austin, TX. There Jeffrey was the songwriter and front man for the wildly mediocre ensemble, The Distractions. The band played for eight years to packed underground college clubs and empty dance halls and was touted as one of the most average bands in the saturated Austin music scene. While finally learning mathematics at the turn of the century, Williams realized that the pizza delivery profession was proving more profitable than back alley club gigging and traded in his guitar for the more lucrative sure bet of creative writing. He published short stories of Southern fiction, spinning tales of the grotesque and gothic supernatural and building wealth unmatched by any with a middle school diploma. Retiring to the beautiful environs of Knox County, Ohio in 2003, Williams discovered the joy of raising children that are infinitely smarter than his self. He now lives in Mount Vernon with his two amazing sons, Samuel and Oliver, who he strives to teach to never be too far from their passions as they connect us to who we are.